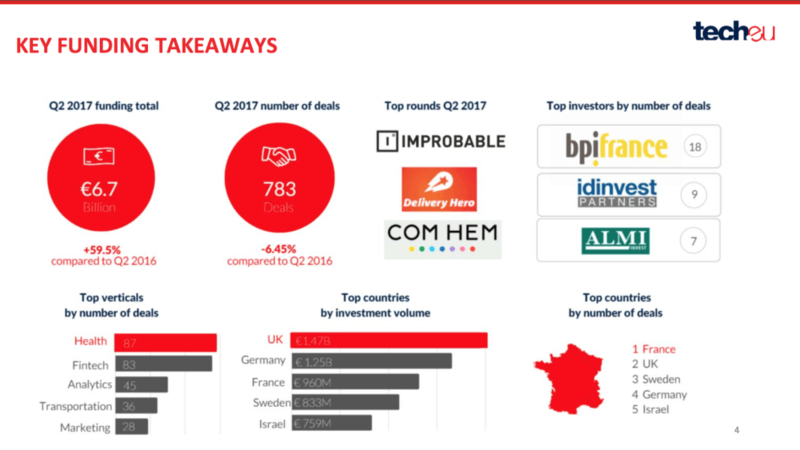 Our latest European Tech Funding and Exits Report shows that a high proportion of later-stage rounds made Q2 2017 the best quarter on record for European tech funding. European and Israeli startups completed 783 funding rounds in Q2 2017, totalling a whopping €6.7 billion, or €2.1 billion more than the next highest quarter on record, Q1 2016. Compared to Q1 2017, there was a 10.2% drop in the number of deals, but a 48.9% increase in investment volume. Investment volume jumped 59.5% from the same quarter last year. 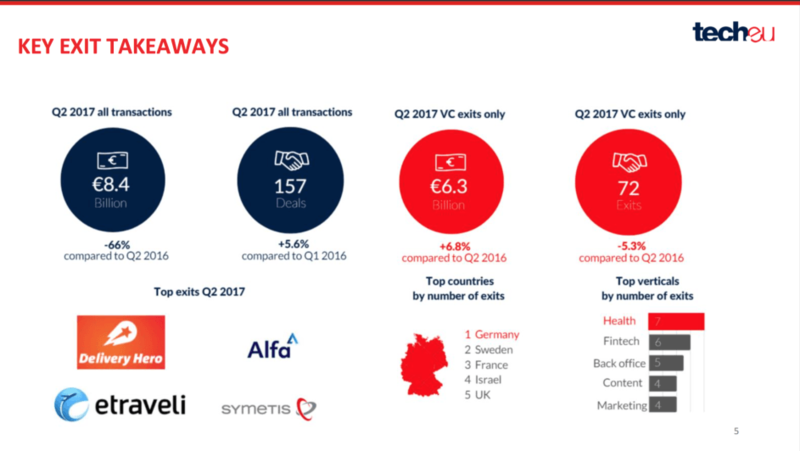 Despite slow M&A activity overall, it was another strong quarter for VC-backed exits; the number of transactions involving VC-backed tech companies grew to 72 from 65 in Q1 2017, but the value of those transactions dropped from €16.2 billion in Q1 2017 to €6.3 billion in Q2 2017. Exit volume was slightly higher than Q2 2016, when it was €5.9 billion across 76 deals. Our newly released European Tech Funding and Exits Report dives deep into these numbers. It’s the second time we are releasing one combined report that looks both at funding and exit figures in one comprehensive analysis. The report is the culmination of our ongoing monitoring of 150+ news sources across Europe in 12+ languages – including Israel, Russia, the Balkans, Norway, Switzerland, Turkey and other countries we consider part of the European technology industry. These deals are also outlined on a weekly basis in our newsletter. This is our fourth year producing in-depth reports, and each has proved to be a very valuable resource for corporates, VC and M&A firms, and other prominent actors in Europe’s ecosystem. You can purchase the full Q2 2017 report here for just £125. This is just a small taste of our comprehensive report into Europe’s exit and funding scene, so what else can you expect? For a deep-dive into the above and our accompanying analysis, you can purchase the full report here for just £125. Any questions? Please use our contact form.